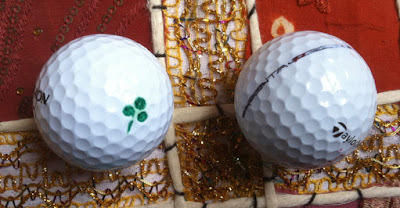 Golf Predictor - Golf Blog: Balls of a Trip! Pictured above is the unexpected booty from my recent Golf Predictor trip to the Trophee Hassan II tournament in Morocco. I caught up with former Ryder Cup winner Paul McGinley's group on the first tee (his tenth hole) and immediately enjoyed some good natured banter with his Scottish caddie, thanks to my fine thick Irish accent! McGinley was playing with fellow former European PGA Tour winner Pablo Martin from Spain and two amateur players. I became their gallery and was soon called into action. After his ball was inadvertently picked up by a spectator near the first green, McGinley asked me would I mind going back to the clubhouse and getting a rules official to confirm what he should do next. While I was surprised that a pro with hundreds of tour events under is belt (and his playing partner) did not know such a basic rule, I was only to glad to help my compatriot out. One sweaty uphill run in the blistering heat with a bag on my back later, it was mission accomplished and the group could proceed! After holing out on the ninth (his final hole), McGinley sought me out and threw his golf ball across the green in my general direction with some force. I'd like to think that he was thanking me for services rendered and not trying to kill me for being an annoying git! His TaylorMade ball is shown on the right of the top picture above, with a fairly unimaginative black line on it for identification purposes. After a rest in the shade on the practice range watching Darren Clarke working out the (non-existent to me!) kinks in his swing, I resumed my stalking of Irish golfers when former Irish Open champion Shane Lowry passed by on the way to the tenth tee. We were practically mates at this stage, having passed by him earlier on a parallel hole and exchanging pleasantries in our finest Irish brogues!. As the gallery for this group also, I was soon called into action again as unfortunately, Lowry's drive ended up in the cabbage! Having located the ball with the Irish national flower on it (top picture, left hand side), I asked the stupidest question I've asked in a long time. "Does it have a shamrock on it? ", I enquired of the Irish man playing with two Dutch guys and a Moroccan! Having taken a drop for an unplayable lie, Lowry proceeded to make one of many bogeys that he made that day. On his way to the next tee, Lowry gave me the aforementioned ball, as I had found it for him. That's the sort of nice chap that he is and I duly added it to my collection! 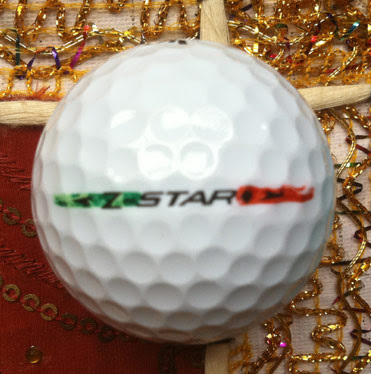 On examining the ball, I noticed the other side of the ball also had patriotic markings, with the colours of the Irish flag (second picture above) also acting as identification for the proud Irish man. I followed this group until the 16th, which featured some fine play from Robert-Jan Derksen (although he didn't score too well in a comfortable 70, -1) and unfortunately some not so fine from Lowry (he went around in 81, +10). At this stage, a severe dehydration headache and a waiting taxi driver meant the end of a highly enjoyable day where I got to interact with several pros much more than I would ever have thought possible. I can hardly next for the next trip! p.s. : I thought it apt to photograph the golf balls on the exotic cushion cover I bought (read "paid over the odds for"!) in Morocco!